Sure, walking down the aisle to your smiling groom is great, but one of the most fun parts of your wedding day is getting ready with your bridesmaids the morning of! In the excitement and anticipation of your big day, there’s nothing better than having your sisters and girlfriends by your side, sipping mimosas, getting pampered, and sharing fun stories. Show your favorite ladies just how much you love and appreciate them with some matching gifts everyone can wear while getting ready on your wedding day. From matching robes to customized button-ups, we’ve gathered our favorite getting ready outfit ideas for you and your crew. Bonus: They make for super cute pictures, too. 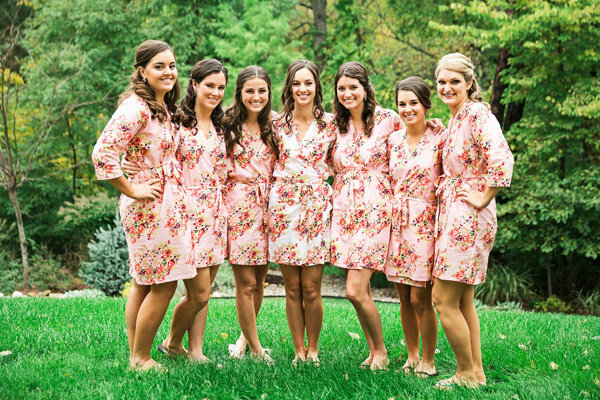 Matching floral robes look sweet and sophisticated and won’t ruin your picture-perfect hair and makeup when it’s time to slip them off. Make sure you really stand out in a white robe, especially if all the bridesmaids are rocking robes in all the same bold shade. It’s a classic option that looks great in pics, and it's also an easy way to spotlight the bride. Getting floral robes in your wedding colors adds some variety, and the matching sunglasses really steal the show. Add some fun to your outdoor photos with customized pairs! Can’t pick a color? No problem! Having each bridesmaid don a different bold color is a great way to deviate from the stereotypical cookie-cutter bridesmaid look. None of your bridesmaids are exactly the same, so why should their outfits be identical? Getting everyone a different color robe adds some variety and dimension. Plus, it lets each girl show off her personality. Silky robes feel luxurious, and they also make for a perfect gift for your gals to get ready in. Opting for a bold color with lace detailing looks great for pics, and your girls can wear them long after the wedding festivities. For a girlier look, matching frilly robes are perfect. Pair with matching flip-flops, especially if pedicures are on the getting-ready menu! Getting ready in robes makes having your hair and makeup done a breeze. If you’re waking up to cooler temps, a fuzzy bathrobe is a warm and cozy option. If floral silk robes aren’t your thing, these comfortable fuzzy leopard robes look so cozy and add so much fun on your big day. Nothing says “let’s get pampered” quite like these adorable spa-inspired towel wraps. Get them personalized with each girl’s name, and pair with some cozy slippers for a getting-ready gift they’ll wear again and again. Is there anything more classic than a crisp white button-up? Customized in a monogram, these are perfect gifts for everyone in your bridal party ─ including the flower girls! For a fun sporty look, striped menswear-inspired button-ups are comfy and chic. Pair with your favorite leggings or yoga pants for a comfortable look you can wear all morning. Have your girls grab something from their very own closets! Everyone has a simple plaid button-up, and the mix and match of patterns and colors add a rustic vibe and make for an eye-catching photo. For a cute yet relaxed look, opt for customized tanks, especially when prepping for a warm-weather wedding. The customized bridal party title and nickname make them extra special. Add some glam with these bedazzled tanks, complete with each girl’s bridal party role. Not only are they comfortable to wear all morning, they also make for great matching tops to wear for the bachelorette party. If you’re getting ready in cooler temps, matching lightweight hoodies are the perfect option. The deep V neckline makes it easy to slip on and off over an updo, and the longer length is perfect to wear with comfy leggings or yoga pants. Keep it simple with a plain gray T-shirt, comfortable enough to wear all morning. The embroidered monogram adds a subtle personal touch. Keep it simple on your big day with matching button-up tunics in your wedding colors. They’re simple to slip on and off over finished hair and makeup, and they can totally be re-worn as a wardrobe staples with leggings or skinny jeans. Sometimes, the best matching tops don’t have to be customized on Etsy. These subtle navy tanks all look great on the bridesmaids. Sleeveless rompers aren’t just for going out in the summer; they make for great getting ready outfits! Stay on trend with matching floral spaghetti strap rompers, and keep a white one for the bride! They make for great photos and can easily be worn again after your big day. What’s better than staying in your pajamas all morning? Short-sleeve & shorts pajama sets are perfect for warmer temps, and they ensure everyone is coordinating on the wedding morning. For a more glamorous look, these matching silk shorts paired with a simple lace cami are the epitome of sleepover chic. Monogrammed long-sleeved pajamas look sleek and polished in photos and are comfortable enough to wear all morning. They make for a sweet morning-of look, and it’s a gift your bridesmaids will appreciate when it’s time to crash that night. Getting ready with your girls feels like a slumber party as it is, so getting all your girls matching nightgowns seems like a no-brainer. Make sure you take time to snap some pics all cozied up in bed like the good ol' days!